Toledo Refining Company LLC (TRC) is located in Oregon, Ohio and is owned by PBF Energy LLC. The refinery has a crude oil processing capacity of 170,000 barrels per day. TRC is currently accepting applications for Refinery Process Operator positions. Process Operators operate, maintain and repair units and equipment. A Process Operator works 12 hour rotating shifts on various units within the refinery which process crude oil as a feed stock in order to produce gasoline, diesel, jet fuel, various chemicals and other products. Process Operators are trained in the operation of plant processing equipment, including pumps, compressors, furnaces, heat exchangers, valves, distillation columns and other equipment common to refinery operations. Our Company is committed to a foundation of safe and environmentally compliant operations so Operators must follow all procedures and safe work practices. New hires are subject to a one year probationary period and will be required to complete a 36 month apprenticeship program. Starting pay is $30.92 per hour. An Operator may be responsible for: maintaining equipment and operations; climbing ladders, tanks and towers up to 250 ft.; taking samples/readings of various process streams; initiating work orders and permitting for work related to the assigned unit; maintaining proper and safe process operations of the operating equipment; and communicating effectively during the shift and at shift relief regarding key process unit and equipment information. Must be at least 18 years of age; be legally authorized to work in the United States without restrictions; hold a High school diploma or equivalent; and hold a current driver’s license. Must be willing to perform/comply with the following: working forced or mandatory overtime based on refinery needs; working on holidays and weekends; working in enclosed/confined spaces, such as tanks and towers; working with large, hot, high-speed machines; lifting a minimum of 50 pounds; working around chemicals; wearing fire retardant clothing and personal protective equipment; maintaining/shaving your face daily so that a respirator/face mask can seal properly; performing fire fighting duties; working outside in harsh weather conditions; complete all job training and testing requirements; and working with petroleum products and support systems that are under high pressure and heat. Written tests and assessments; meeting physical criteria for the job; a physical skills demonstration test; ability to demonstrate basic computer skills; pass a background check and drug screening; be eligible to qualify or hold a Transportation Workers Identification Credential (TWIC card); and be eligible to qualify or hold a State of Ohio 3rd Class Steam Engineer License (SEL). In order to be considered for this position, applicants must submit their resume in Microsoft Word or .pdf format per the following process on or before 11:59 P.M. of May 5, 2019. All interested candidates may apply by going to www.pbfenergy.com/careers and select “Refinery Process Operator” (Oregon, OH). All applicants must provide a valid e-mail address where they can be contacted regarding updates on the recruiting process. Should an applicant be selected for testing, contact will be made via email. All contact information must be accurate and up to date. There will be 4 stages of the hiring process. Relocation is not available for this position. Phone calls will not be accepted. 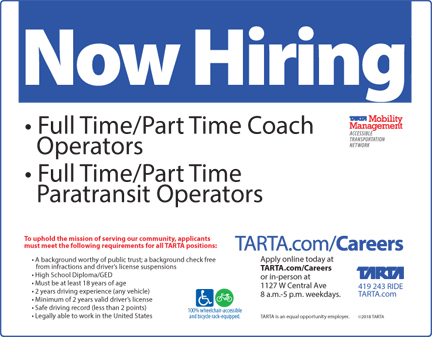 -Case Manager, Part-Time position, $14.00 - $18.00 per hour, Bachelors Degree. 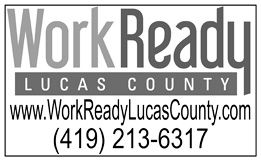 -Administrative Support, Part-Time position, $11.00 - $14.00 per hour, High School Diploma. The above positions require: Computer Experience/Word Processing, conduct oneself in a Professional manner, working independently/multi-tasking, having dependable/own transportation and excellent oral and written communication skills. The YWCA of NWO, whose mission is to eliminate racism and empower women, is looking to hire a Racial Justice Director. This candidate will manage the Dialogue To Change program and lead other racial justice initiatives. Must possess excellent organizational skills, be detail oriented and have a proven track record of delivery and understanding of racial inequities. Valid driver’s license and Bachelors in social work or related field required. 30 hrs./wk. $22.00/hr. with full benefits and potential for growth. Position will remain open until filled. Notice to Bidders: Inquiry # FY19-62, (Project # 0051-19-198) for North Engineering Lab/Classroom Renovations - Phase 1 for the University of Toledo. Sealed bids for this project must be clearly marked with the project number on all inner and outer envelopes and/or shipping containers. Bids must be addressed and delivered to the University of Toledo, Facilities and Construction, Plant Operations, Room 1100, 2925 E. Rocket Drive, MS 216, Toledo, Ohio 43606 before 2:00 p.m., Tuesday, May 7, 2019. Bids will be publicly opened that same day at 2:05 p.m. in the Plant Operations Building, Room 1000. Copies of Plans, Specifications, and Bid Forms may be obtained from Becker Impressions, 4646 Angola Rd., Toledo, Ohio 43615. 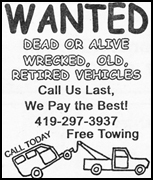 Call 419-385-5303 for an appointment to pick up bid package. A cost of $160.00 will be charged per set. Any further information may be obtained from Bryan Greene of Champlain Architecture at 419-464-7697. One Pre-Bid Conference will be held on Tuesday, April 30, 2019 at 10:00 a.m. in the Plant Operations Building, Room 1000, at the University of Toledo, 2925 E. Rocket Drive, Toledo, OH 43606. Total Bid Guaranty and Contract Bond are required per section 153.54 of the Ohio Revised Code. EDGE Participation Goal: 15%. Project Estimate: $2,389,665.00; Breakdown: General: $2,099,365.00; Plumbing: $39,400.00, Fire Protection: $6,200.00; HVAC: $146,200.00; Electrical: $98,500.00. 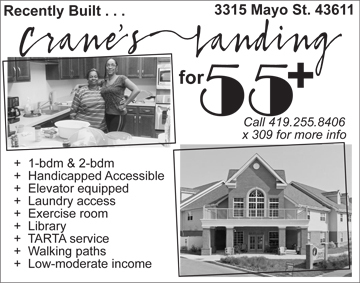 Alpha Towers - Section 8 waiting list is open for anyone 62 and older! 1 and 2 bedroom units are available! and older! 1 and 2 bedroom units are available! Fully renovated beautiful living in Toledo's historic Polish Village. Abundant Life of Perrysburg is accepting applications for its subsidized apartment facilities. Abundant Life #1 offers independent living for senior citizens 62 years of age or older and individuals 55 or older with a physical impairment. Abundant Life #2 is a supportive living complex for people 62 and older. To apply individuals must meet the age requirement and an annual income requirement of no more than $23,550.00 for one person or $26,900.00 for two people. We are located in the Three Meadows subdivision near the Manor of Perrysburg. Our garden apartments offer one bedroom, private patios, with individually controlled thermostats for heat and air conditioning. Abundant Life #1 offers bathtubs, while Abundant Life #2 offers walk-in showers and pull cords for emergencies. We have a bus that transports all residents to area grocery stores and monthly outings. We offer exercise, worship services and a variety of opportunities for our active and not so active seniors. 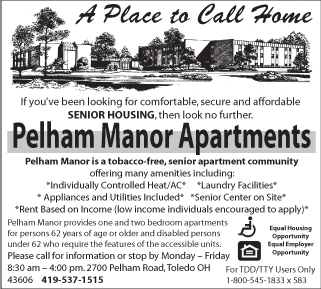 Please call (419)874-4371 to find out more about our fabulous facilities and our availability for apartments. You may also visit us on the web at abundantlifeperrysburg.org. Senior Community for persons 55 years and older. Rent is based on income. Our Activity and Service Coordinators are on site. Heat included. Chauffeured transportation to nearby shopping and banks available. Many homes newly remodeled and available immediately.